When we say Vietnamese soup, you say pho, right? We would expect that 9 out of 10 times–with the other soup being bun bo hue given the proliferation of pho restaurants across the US. But in actuality, we would suggest that most soups eaten in Vietnam on a daily basis are actually not pho or bun bo hue, but home style soups eaten as part of a larger family meal, of which there are as many varieties as there are different vegetables used in Vietnamese cuisine. For almost any vegetable you see in the Vietnamese market, we can think of at least one home style soup where it’s a key ingredient, with few rare exceptions. For example, edible chrysanthemum or tan o is a favorite soup vegetable. Taro also makes a wonderful, milky, rich soup. Bittermelon soup is a classic family favorite. Just boiling rau muong (Vietnamese water spinach) with some ngo om (rice paddy herb) paddy and tomatoes makes for quick and simple soup. We can go on and on, but in this post we want to feature dill and mustard greens–pickled mustard greens to be exact. This seemingly strange combination makes for a deliciously fragrant and tangy soup called canh dua chua thia la, found in many Vietnamese homes but never in any restaurants. 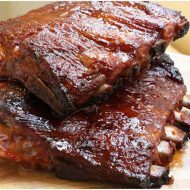 Typical home style meals consists of a protein, for example spare ribs. Some of the ribs would be saved to make a simple stock. 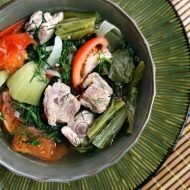 Add fresh dill and tomatoes from the market and combined it with pickled mustard greens, a staple (like kimchi is to Korean families) in many Vietnamese households, and within no time you have a soup to go with the spare ribs. This type of meal planning is fast, efficient, and best of all delicious! So if you grew up in a Vietnamese household or if you are fortunate to travel in the small restaurants in rural towns of Vietnam, you may have eaten a soup like this. 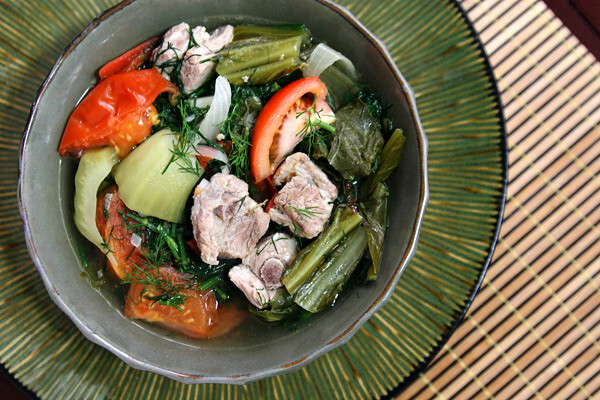 The sour tang from the pickled mustard greens and tomatoes, balanced by succulent spare ribs and freshness of dill, is one of our favorite simple daily soups to enjoy that’s not named pho. In medium size stock pot, add stock/water, salt, and with pork ribs and bring to boil and reduce to simmer for about 20 minutes to soften the ribs (if using chicken, this isn't necessary). Skim off any gunk. 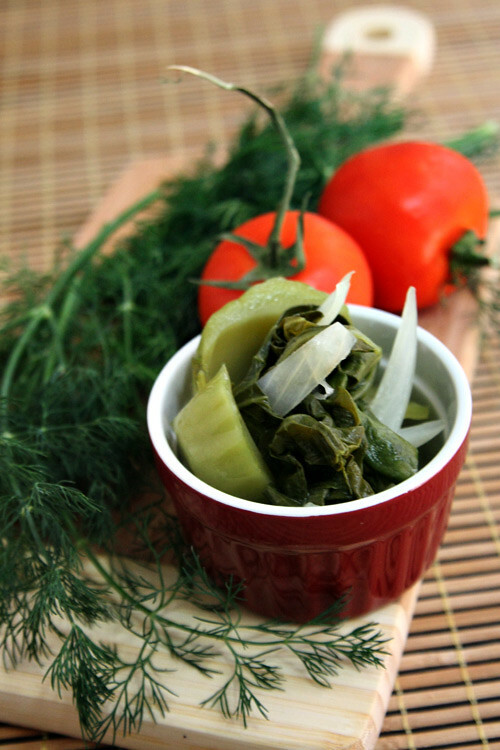 Add tomatoes and when slightly softened after a few minutes, add the pickled mustard greens, pickling juice and all. Season to taste with additional salt or fish sauce and optional chili. Finally, add the chopped dill and remove from heat. 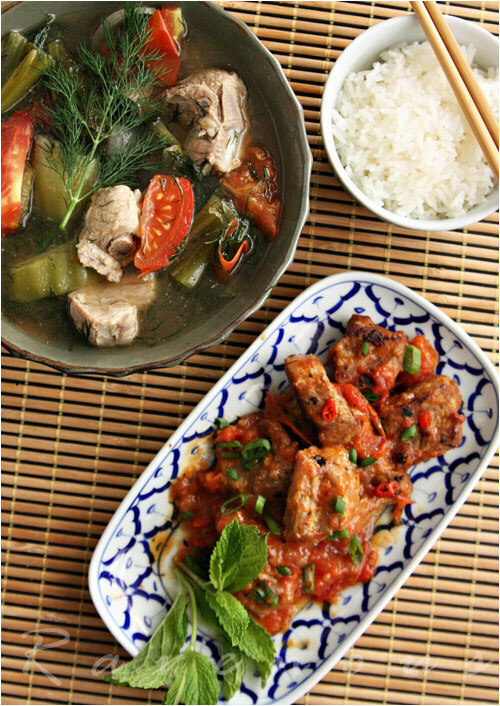 Serve with jasmine rice and protein such as our sweet and sour spare ribs. 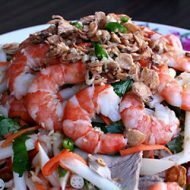 This is our entry to Delicious Vietnam, a monthly blogging event celebrating Vietnamese cuisine created by Anh of A Food Lovers Journey and yours truly! This month’s host is also Anh of A Food Lovers Journey. 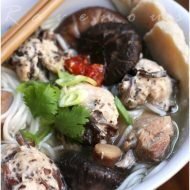 Submit any Vietnamese food related posts to Anh at anhnguyen118 [at] gmail [dot] com by Sunday April 10 7 pm pacific time. 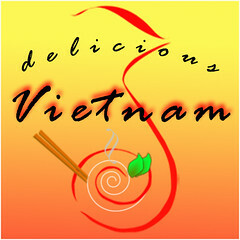 For more information on how you can participate, visit Delicious Vietnam information page. You're right.. when I crave for a Vietnamese soup I would think Pho. My family would crave Pho more than they would crave for MAMI(our local version of a noodle soup). But this would be another Vietnamese soup to add to our repertoire. It's great to learn new things… also it's interesting that you also have pickled mustard.. we call that in the Philippines as buro. I would like a bowl right now! @malou: yes, try buro in soups, it makes for a great sour/sweet soup! One of my fav Viet home soups. The version I eat is w/o dill and w/beef. Is this a family recipe? Btw, "printable recipe" needs to be linked. Thanks guys! Made this last night with chicken instead of pork and it was wonderful. Very nice, thanks for the information. I have had pickled mustard greens soup with pork but never with dill. I imagine the swirl of wonderful strong herbal flavors in this soup must be delicious! i remember when my mum used to make this for dinners some nights. it was so yummy but i dont think i have ever eaten it with dill. @mycookinghut : you said it! So comforting! My grandmother used to make this dish but she was the only one in the family to do so, so when she moved away and never had it again. now I need to make some. My favorite dish growing up. Ive had it with and without dill and its both so delicious!! We use tamarind powder sold in asian markets in this soup. I love mine sour! Yum! This is my #1 requested dish when I go home to visit my parents. It’s tremendously flavorful and the best way to get me to eat my greens! My mom also make another version with salmon which is equally tasty. This is the first recipe I learned to make! Such a wonderful soup, and you can replace the pork with any firm fish easily. I love using salmon or black cod. I also have ended up substituting fennel tops for dill – primarily because I think this is what my mother in law had on hand…so I’ve learned to love it this way as well. The chicken stock and homemade mustard greens are a must! Just add tomatoes and a pinch of tamarind and you are set! Thank you Ravenous Couple for documenting these recipes so well! I honestly couldn’t do it without your explanations (in English) and pictures. You seem to have the same cooking style as my Mother-in-law…which means your recipes are so very much appreciated! Thank you! We believe good food and cooking brings friends, family, and loves ones together—and keeps them together, hence our motto, Cooking Life Together. Join us as we celebrate our life long journey of cooking Vietnamese cuisine and more! Pan Seared Black Cod with Miso Butter and All-Clad d3 Armor Fish Pan Giveaway! ©2019 The Ravenous Couple. Design by Purr.